'Why we eat what we eat?' is a key question for the 1990s, posed again and again in government departments, in sectors of the food industry, by professionals in health, in education, and in catering, to name a few. It is the same question adopted as the springboard for the UK Economic and Social Research Council's (ESRC) Research Programme on 'The Nation's Diet' (1992-1998), a wide ranging, multi-disciplinary set of co-ordinated basic research projects across the social sciences, including economics, psychology, social anthropology and sociology, as well as education and media studies. Annie S. Anderson, Hannah Bradby, Robert G. Burgess, Michael Burton, Helen Bush, Pat Caplan, Mark Conner, G. Jill Davies, Richard Dorsett, Alan Dowey, John Eldridge, Ben Fine, Andrew Flynn, Leslie Gofton, Susan Gregory, Malcolm Hamilton, Michelle Harrison, Michael Heasman, Spencer Henson, Pauline Horne, Rhiannon James, Anne Keane, Debbie Kemmer, Mike Lean, Diana Leat, Zara Lipsey, C. Fergus Lowe, Sally Macintyre, Terry Marsden, David Marshall, Lydia Martens, David Miller, Marlene Morrison, Elizabeth Murphy, Georgina OIiver, Susan Parker, Christine Phipps, Tessa M. Pollard, Rachel Povey, Jacquie Reilly, Richard Shepard, David Smith, Paul Sparks, Andrew Steptoe, Ann Walker, Alan Warde, Jane Wardle, Anna Willetts, Janice Williams, Rory Williams, Judith Wright, Neil Wrigley, Trevor Young. 1. 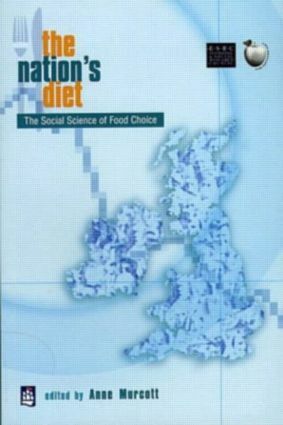 Introduction: Food Choice, Social Sciences and 'The Nation's Diet' Programme. Part One: Social Sciences and Food Choice: Proceeding from Axioms, Operational Definitions and Measurements. 2. The Effects of Life Stress on Food Choice. 3. Understanding Dietary Choice and Dietary Change: Contributions from Social Psychology. 4. Changing What Children Eat. 5. Consumer Theory and Food Choice in Economics, with an Example. 6. What We Eat and Why: Social Norms and Systems of Provision. 7. How British Retailers Have Shaped Food Choice. 8. A Sociological Approach to Food Choice: The Case For Eating Out. Part Two: Social Sciences and Food Choice: Analysing Socio-political Processes and Cultural Constructions. 9. Regulation, Rights and the Structuring of Food Choices. 10. Studying Food Choice in its Social and Cultural Contexts: Approaches from a Social Anthropological Perspective. 11. Food Choice and Diet Change Within the Family Setting. 12. The Marriage Menu: Life, Food and Diet in Transition. 13. Ethnographies of Eating in an Urban Primary School. 14. Food Choice, Food Scares, and Health: the Role of the Media. 15. Food Choices for Babies. 16. Food Choice and Culture in a Cosmopolitan City: South Asians, Italians and other Glaswegians. Part Three: Social Sciences and Food Choice: Additional Perspectives. 17. Food Choice and the British System of Formal and Informal Welfare Provision: Questions for Research. 18. British Market-Research Data on Food: a Note on Their Use For the Academic Study of Food Choice. 19. The Discourse of Scientific Knowledge of Nutrition and Dietary Change in the Twentieth Century. References. Index of Authors. Index of Principal Topics.